The Antero Dam was the first dam built on the South Platte River. It is an earth-fill dam constructed in 1909 at an elevation of 8,942 feet above sea level and approximately 100 miles southwest of Denver. On June 1, 2015, the reservoir was closed to the public so that it could be drained in preparation for the rehabilitation work. This project is Phase Three of a four-phase project designed to improve the safety of the dam and double the capacity of the reservoir. Geo-Solution was contracted to install the soil-bentonite cutoff wall along the length of the dam. Construction of a soil-bentonite cutoff wall was included in the design to decrease the flow through the permeable zones along the length of the dam. The cutoff wall included the installation of 158,000 vertical square feet (vsf) of soil-bentonite slurry wall. The wall was installed to a maximum depth of 47 feet below ground surface, and was keyed into the underlying low permeability bedrock. The trench was a total of 3,860 feet in length with two minor turns. The target laboratory permeability of 1 x 10-7 cm/s was exceeded with the backfill average permeability of 2.6 x 10-8 cm/s. The specifications required greater than 25% passing through the #200 sieve for the soil bentonite backfill. The laboratory range for the backfill fines content passing the #200 sieve was 54.6% to 69.1%. 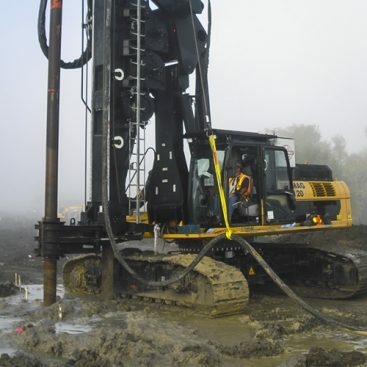 The excavation was supported by bentonite slurry and performed using a Komatsu PC1250 with Geo-Solutions’ long-reach boom and stick attachment. Bentonite slurry was produced on site using a slurry pond with water from the dam outlet. Slurry was pumped from the pond, which was located in the spillway, up to the crest of the dam and along the length of the trench. Slurry was pumped a total of approximately 5,600 feet. Slurry was also pumped to the individual mixing pits for the production of soil-bentonite backfill. Two earthen mixing pits were used to create backfill. The borrow soil was loaded into pits, then slurried and dry bentonite was added and blended into homogenous backfill using dozers and excavators. The soil-bentonite backfill was loaded into haul trucks for transport to the trench. 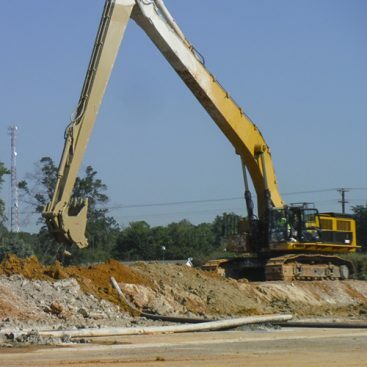 Due to limited space on the dam, remote-mixing of the soil-bentonite backfill was utilized. 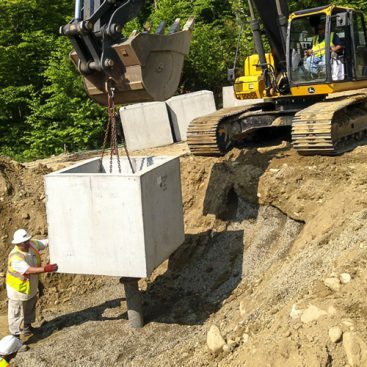 Dump trucks were operated and maintained by the General Contractor to haul spoils off of the dam crest and to haul and place mixed backfill into the trench. 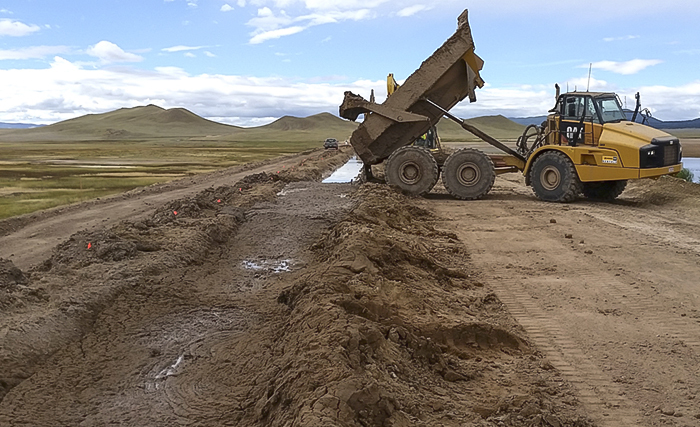 Due to limited space for passing trucks, as there was only one haul road and limited space on both sides of the trench, haul routes were varied throughout the project to ensure the trucks’ efficient use. Drivers and the PC1250 operator used an independent radio network to reduce distraction and to allow for better communication. Lightning was the most common delay in production. Geo-Solutions initiated an RFI which removed the filtrate-loss specification for in-trench slurry. 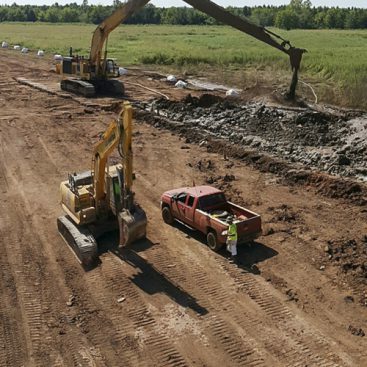 Due to the soil conditions encountered in previous excavation projects at the reservoir and concerns with trench stability in an active dam, additional measures were required by the client and the State Engineer’s Office. These measures were outlined in our work plan, and required certain protocols to be established in the event of longitudinal cracking or widening of the trench. Should established thresholds have been reached, immediate action was to be taken to slope the trench sidewalls, raise the slurry level, and in severe cases to halt excavation and return material to the trench to ensure stability of the work platform. Geo-Solutions completed the entire length of slurry trench excavation without triggering any of the thresholds.